For anyone who has ever wished there were more hours in the day, geoscientists have some good news: Days on Earth are getting longer. 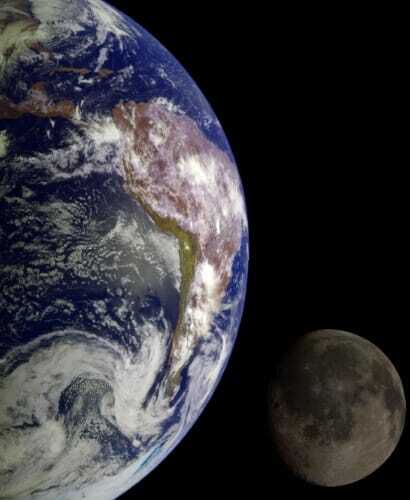 A new study that reconstructs the deep history of our planet’s relationship to the moon shows that 1.4 billion years ago, a day on Earth lasted just over 18 hours. This is at least in part because the moon was closer and changed the way the Earth spun around its axis. “As the moon moves away, the Earth is like a spinning figure skater who slows down as they stretch their arms out,” explains Stephen Meyers, professor of geoscience at the University of Wisconsin–Madison and co-author of the study published June 4 in the Proceedings of the National Academy of Sciences. It describes a tool, a statistical method, that links astronomical theory with geological observation (called astrochronology) to look back on Earth’s geologic past, reconstruct the history of the solar system and understand ancient climate change as captured in the rock record. During its flight to Jupiter in 1992, NASA’s Galileo spacecraft returned images of the Earth and Moon. Separate images were combined to generate this view. Earth’s movement in space is influenced by the other astronomical bodies that exert force on it, like other planets and the moon. This helps determine variations in the Earth’s rotation around and wobble on its axis, and in the orbit the Earth traces around the sun. These variations are collectively known as Milankovitch cycles and they determine where sunlight is distributed on Earth, which also means they determine Earth’s climate rhythms. Scientists like Meyers have observed this climate rhythm in the rock record, spanning hundreds of millions of years. But going back further, on the scale of billions of years, has proved challenging because typical geologic means, like radioisotope dating, do not provide the precision needed to identify the cycles. It’s also complicated by lack of knowledge of the history of the moon, and by what is known as solar system chaos, a theory posed by Parisian astronomer Jacques Laskar in 1989. The solar system has many moving parts, including the other planets orbiting the sun. Small, initial variations in these moving parts can propagate into big changes millions of years later; this is solar system chaos, and trying to account for it can be like trying to trace the butterfly effect in reverse. Last year, Meyers and colleagues cracked the code on the chaotic solar system in a study of sediments from a 90 million-year-old rock formation that captured Earth’s climate cycles. Still, the further back in the rock record he and others have tried to go, the less reliable their conclusions. For instance, the moon is currently moving away from the Earth at a rate of 3.82 centimeters per year. Using this present-day rate, scientists extrapolating back through time calculated that “beyond about 1.5 billion years ago, the moon would have been close enough that its gravitational interactions with the Earth would have ripped the moon apart,” Meyers explains. Yet, we know the moon is 4.5 billion years old. So, Meyers sought a way to better account for just what our planetary neighbors were doing billions of years ago in order to understand the effect they had on Earth and its Milankovitch cycles. This was the problem he brought with him to a talk he gave at Columbia University’s Lamont-Doherty Earth Observatory while on sabbatical in 2016. 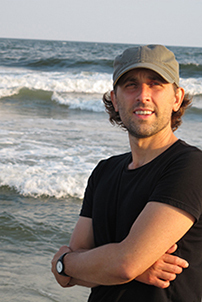 The two teamed up to combine a statistical method that Meyers developed in 2015 to deal with uncertainty across time — called TimeOpt — with astronomical theory, geologic data and a sophisticated statistical approach called Bayesian inversion that allows the researchers to get a better handle on the uncertainty of a study system. They then tested the approach, which they call TimeOptMCMC, on two stratigraphic rock layers: the 1.4 billion-year-old Xiamaling Formation from Northern China and a 55 million-year-old record from Walvis Ridge, in the southern Atlantic Ocean. With the approach, they could reliably assess from layers of rock in the geologic record variations in the direction of the axis of rotation of Earth and the shape of its orbit both in more recent time and in deep time, while also addressing uncertainty. They were also able to determine the length of day and the distance between the Earth and the moon. “In the future, we want to expand the work into different intervals of geologic time,” says Malinverno. The study complements two other recent studies that rely on the rock record and Milankovitch cycles to better understand Earth’s history and behavior. A research team at Lamont-Doherty used a rock formation in Arizona to confirm the remarkable regularity of Earth’s orbital fluctuations from nearly circular to more elliptical on a 405,000 year cycle. And another team in New Zealand, in collaboration with Meyers, looked at how changes in Earth’s orbit and rotation on its axis have affected cycles of evolution and extinction of marine organisms called graptoloids, going back 450 million years. Citation: Proterozoic Milankovitch cycles and the history of the solar system.